Who doesn't know? Overnight, the children are suddenly shot in length and the wardrobe is empty. Or the spring is on the doorstep and the previous year's clothing is either too small or worn out. The Lillesol basics are supposed to remedy this right here. The cuts are easy-to-sew base cuts that refill the wardrobe in the blink of an hand, both for beginners and advanced skiers. A little more experienced sewing in the morning certainly two to three parts and for beginners are prima "beginner objects". The parts can be sewn in plain colour and combined with more refined parts. Or in the colourful mix with a lot of sewing, ribbons and embroidery something very special. 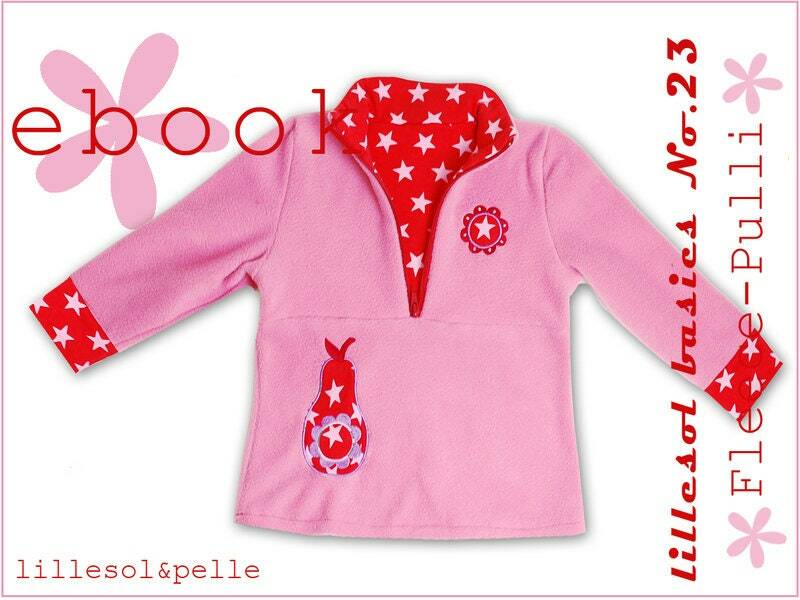 The Lillesol basics No. 23 Fleece sweater is a simple basic cut for a cuddly Fleecepulli to the Drüberziehen. The top of the Lillesol basics No. 23 Fleece-sweater is sewn doubled so that a nice kontrastfarbener jersey flashes when you open the zipper on the stand-up collar slightly. The ebook also explains in the variation possibilities a simple pocket version for internal side pockets as well as the possibility of "zipper plug". Please send your email address. You can find information about ebook shipping in the FAQ and in the highlighted message at the beginning of the article description. Please send me your e-mail address to which the ebook is to be sent with your order. A transfer is prohibited, the ebook is intended for personal use only. In principle, I authorize the commercial use of my ebooks and the sale of the bags and patterns created afterwards without consulting. However, it must be handmade individual pieces that are sold via dawanda or in markets or are created according to customer requirements. The reference to my design should be available on offer. I would like to take commercial providers to my manufacturer's directory. More info on the blog.